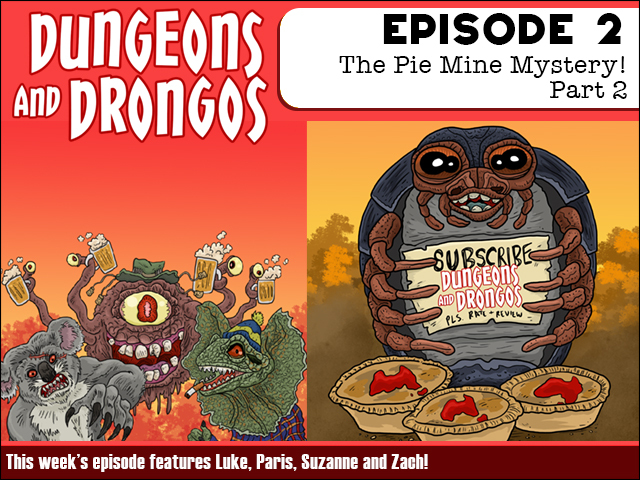 Fruitless Pursuits: Dungeons and Drongos Episode 2: The Pie Mine Mystery Part 2! Dungeons and Drongos Episode 2: The Pie Mine Mystery Part 2! It's the second part of our Dungeons and Dragons meets Fantasy Australia adventure, as our party of bonza mates have a less than opportune arrival at the Chunky Bloke Pie Mine and things go from bad to worse as the mystery deepens! Meet new characters, new creatures, and a whole lot of embarrassing failing. FAIR DINKUM, IT'S A YOU BEAUT JATZ CRACKER!